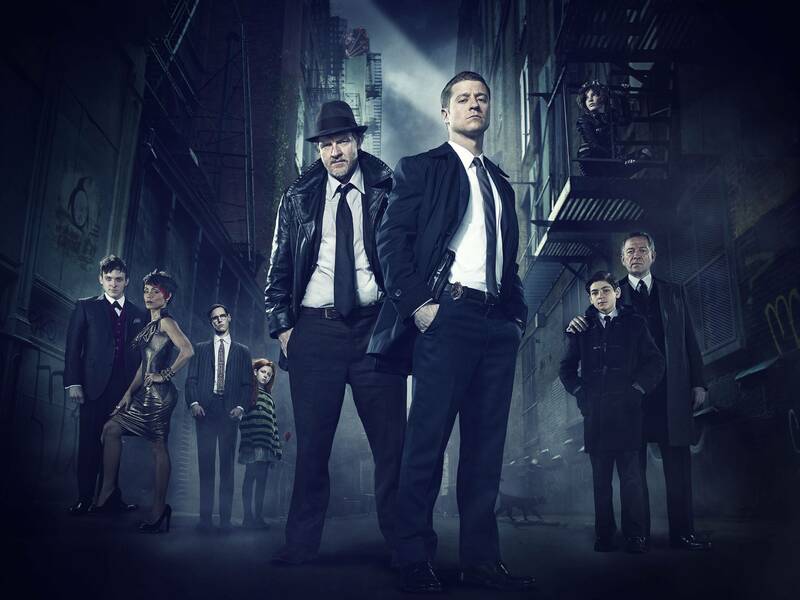 The inaugural episode of the Batman prequel TV series, Gotham aired this Monday. We knew going into the series that the show is based in the DC comics universe and features many heroes and villains associated with Batman, just significantly younger. Warner Bros. weren’t lying , the opening scene of the pilot episode is a young Selina Kyle (Catwoman) witnessing the death of young Bruce Wayne’s parents. However, rather than flashing forward 20 years or so the show continues on from that point. Gotham wastes no time at all diving straight into their plan with very little preamble. The writers dealt with the set up, the most famous part of the origin story in the first 10 minutes so that they can delve into Gotham’s dark history straight away, it is clear that the creators are aware that Batman’s origin has been done and redone and do not wish to retread the same ground. They want to explore areas of Gotham that have never been sufficiently fleshed out before, while retaining the intrigue of Bruce Wayne’s development into the Batman and the rise of Gotham’s most dangerous villains. In my opinion, if they continue down the path they seem to have set off down in the first episode they can achieve this and much more. The first episode had a very distinctive and enjoyable style, Gotham is like a modern day film noir crossed with your typical action based show. It has a dark, 1950s style full of crooked cops and dodgy dealings between the police force and organised crime syndicates. With enough Hollywood gloss and well directed, impactful action to go with it. 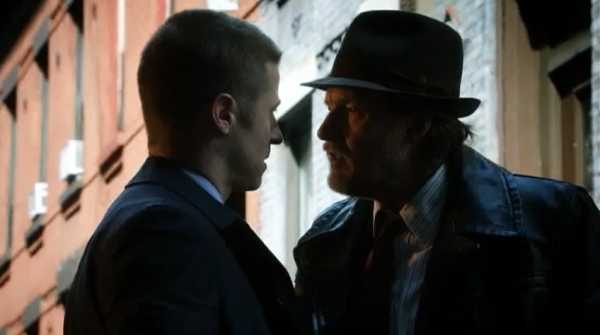 Going into the first episode I was interested to see how Warner would do Gotham, the city that is. 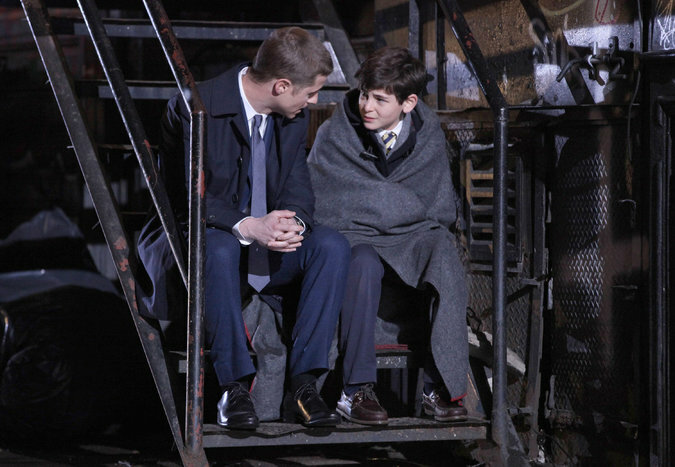 For many Batman fans, Gotham feels like home when done right. Which is odd given it is dark, riddled with crime and raining constantly. Although, bad aspects aside what is brilliant about Gotham is it has its nice points, in many iterations of the fictional city it has beautiful architecture and design that is inspiring in some moments and a comforting presence in others. This is done intentionally by those wishing to pen a good Batman story as there must be something about Gotham worth saving, otherwise why would Bruce Wayne bother fighting crime? Gotham got the balance of these two sides to Gotham exactly right, the architecture was reminiscent of that of Gotham in Tim Burton’s Batman movies, it looked fascinating in the sweeping bird’s eye view shots across the city scape. The dark side of Gotham was also present, the violence was appropriately intense, I was actually surprised by how gruesome some of the scenes were. I wasn’t expecting the amount of graphic detail that was present, I was expecting the camera to cut away when Martha and Thomas Wayne were shot and maybe cut back to Bruce’s reaction. This wasn’t the case, the opening scene was as uncomfortable and brutal as it should have been. 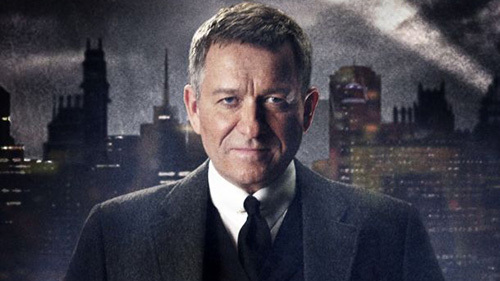 My only criticism if you can call it that was that there wasn’t enough screen time for Sean Pertwee as Alfred Pennyworth. However, you can’t call that a criticism its just the complaint that there wasn’t enough time spent on an interesting character that seems to be portrayed very well by a fantastic screen presence. As for the other actors, well its a pretty stellar cast of skilled actors for the most part. Even the hired goons had at least some charisma. To conclude, I would say this is a promising start, I came into the show expecting to like it and I was still surprised by how excellent it was. This is a very good omen for the following episodes, the writers of Gotham are in a very good position, the essentially have free reign to experiment around with the back story of characters they obviously have a lot of respect for, with the ageless, majestic comic book city of Gotham as the playground. Alfred PennyworthBatmanBruce WayneDC comicsGothamGotham City Police DepartmentHarvey BullockJames GordonThe PenguinThe RiddlerThe Wayne FamilyWarner Bros.